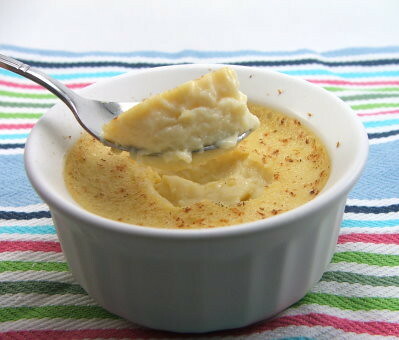 Baked Custard is coming, but first … it’s Friday, and I won an award! Jenn at Bread + Butter passed along the Premio Meme Award to me! Thank you Jenn! Along with this award I am supposed to tell you all seven things about my personality, and then pass the award to seven other bloggers. 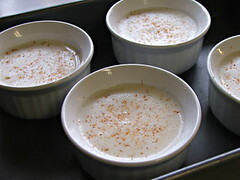 So, if you are interested, the seven things are posted after the recipe. I am passing this award on to the following AWESOME food bloggers who I count among my blogging friends. Not only are they kind and supportive, they really seem to care. That is so rare these days! Now, it’s time for dessert! If you have ever eaten at a Luby’s Cafeteria then you will completely understand what I am about to say. When I was a child I lived in San Antonio, Texas. On most Sunday’s my family would eat lunch at the Luby’s Cafeteria after church. It was always busy, a favorite with the over 60 set to be sure, and I always made a big production of not wanting to wait in line. You see, you have to stand in line like any cafeteria, all the while seeing the wonderful food in the shiny steel steam tables. As you wait you smell the smells, you see the happy people with full trays loaded with their meal wander into the dining room to find a seat, and when you are a child you HATE it. It was sheer torture to the 6, 7, and 8 year old I was and I made sure my whole family knew how I suffered. Despite the torture, and my protests, I loved Luby’s! I almost always got the same thing every visit. I got the fried fish platter with tartar sauce, green beans, macaroni and cheese, clover leaf roll, and chocolate ice box pie for dessert. I say I almost always got the same thing because there were two deviations from my most favorite meal. 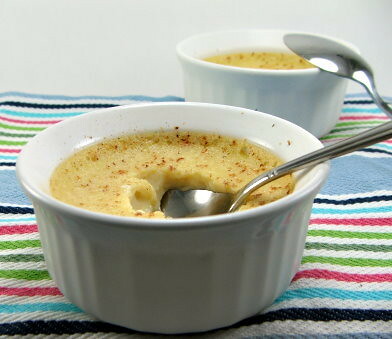 One was the cheese enchiladas, which they did not always have on the menu, and the other was the egg custard. I always had a hard time when it came to desserts. Seeing them sitting there on their frosty metal tray caused the kind of anxiety only the sugar obsessed can know. Chocolate is my first love, and I was hard pressed to choose another against it. I did stray into the fruit pies, the cakes were tempting, but for the most part I had ice box pie or the egg custard. 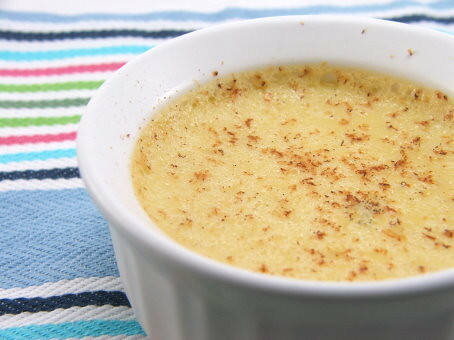 In its unassuming cup it was my creamy runner-up. 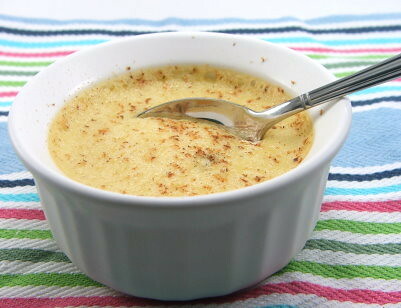 It had a sprinkle of spice on the top which, when combined with the vanilla in the custard, was pure custard heaven! 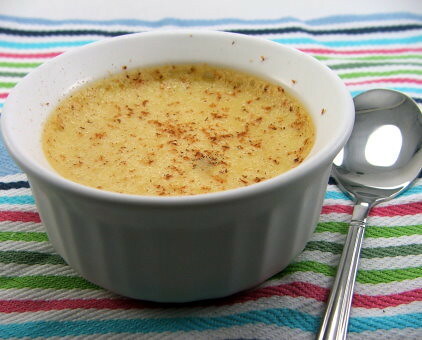 Now that I know my way around a kitchen I am able to recreate this custard at home, and that is what I present to you now. 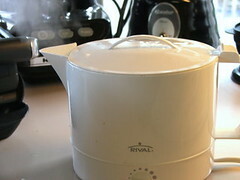 Heat the oven to 325 F and in a kettle boil four cups of water. 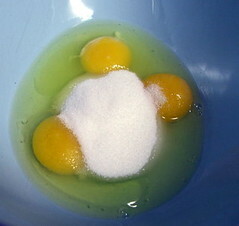 In a large bowl whisk the eggs, egg yolk, vanilla, and sugar until well combined. 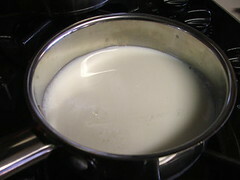 In a sauce pan heat the milk until it simmers. Remove from the heat. 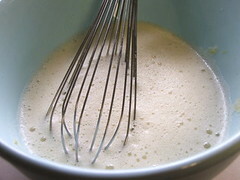 Using a ladle add the hot milk to the egg mixture, one ladle at a time while constantly whisking, until half the mixture is added, then add the remaining milk and blend well. 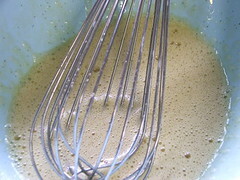 Strain the mixture into a bowl or jug with a pour spout. 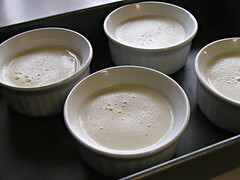 Pour the custard into four 6oz ramekins placed inside a deep roasting pan. Dust the tops with fresh nutmeg. 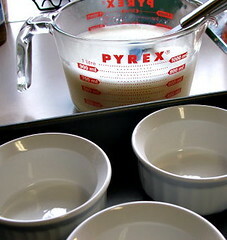 Place the roasting pan on the middle rack of the oven and carefully add the boiling water, making sure it reaches 3/4 of the way up the ramekins. 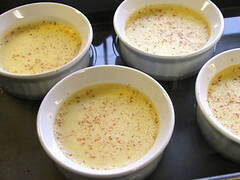 Bake for 40 minutes, or until the custard is set at the edges but jiggly in the center. 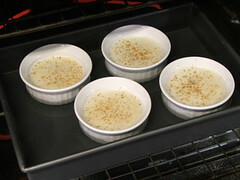 Remove from the oven and allow to cool in the water bath for 30 minutes, then remove the cups from the pan and cool to room temp. Chill for four hours in the fridge before serving. 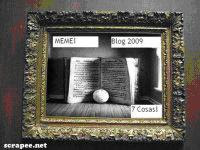 Ok, as promised here are the seven things about me! Prepare to be bored whit-less! 1. Picky – I am really picky. Be it food, work, or driving, I am a really picky person about the oddest things. For example, I detest fresh tomato and can’t stand even a single seed on my food. I just hate the flavor. I also like all my cookbooks to be lined up a certain way. 2. Goofy – Buried deep within the heart of this *mumble*-one year old is the heart of a five year old. Ok. She’s four. I love cartoons, I adore being pushed on the swings, and I love to try on hats at the department store just to get odd reactions from other shoppers. 3. Private – I am a VERY private person. Most people where I work do not know a whole lot about me other than what I tell them, and many of you know that much from reading my blog. I think it comes from a fear of rejection. Or. maybe the details of my life are just depressingly dull. Hummm. 4. Loyal – I am a very loyal person once you get to know me. If I think someone has slighted you, said something ugly about/to you, or been generally nasty not only will I call them out on it, I will then remove them from my life forever. Friendship is something very rare for me and I protect my friends like a mama bear protects her cubs. 5. Insecure – I am an insecure person. Yes, I know it takes some amount of security to admit it, but I am. I always worry that what I do is not enough. I never want anyone to think that I did not do my part, or that I did not care enough to do my best. 6. Quick Temper – This one is a really bad one, but it is honest. I get mad really easily. I think it comes from being an Aries. Lucky for those around me my temper is quick to fizzle. I never really stay mad for long, unless it is something really terrible, then my mad becomes a stubborn grudge. 7. Sentimental – I have lots of fond memories from growing up, and I love to discover something that triggers nostalgia. Be it food, a smell, driving through an old neighborhood, or going through a box of old high school awards, I love to remember the good times.